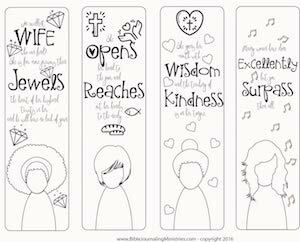 We’re excited to launch the Bible Journaling challenge for Beginners: Love Doodles. Sign up for the challenge and view future challenges here or scroll to the bottom of this tutorial. In week one you’ll discover what love is (1 Corinthians 13:4-8). Approach the Word with the intention to learn something and ask God that he might grow you in his Word today. Similar to the SOAP method, consider what God wants you to see in the Word and how you might apply it to your life. Drawing, illustrating, and writing are methods that creative people use connect with the message in a meaningful way. You can draw pictures in your Bible, paint, illustrate a beautiful picture, or simply doodle. If your Bible already includes images, you can color them as well. There’s no need to try for perfection. The point of drawing is to help you connect with the Word. The Bible Journaling for Beginners challenge is intended to help you get in the Word and grow closer to God, creatively. Weekly challenges can take as little as 10 minutes or as long as you desire. They are designed to be simple, quick, and easy to complete. Printable elements are provided as an alternative to working on the technique. Doodles are basic drawings that may or may not meaning. They can be comprised of letters, lines, and shapes. Doodling is great for reflection, memorization, and going deeper in the Word. You can combine lines and shapes to make just about every type of doodle. What shapes comprise these doodles? Now it’s your turn to try out this this technique. Practice on paper before doodling in your Bible and turn the page to get started on our challenge for this week. Sign up for Bible Journaling Challenge for Beginners below. How fun! Thanks for sharing and challenging everyone to doodle. All for God’s glory! Blessings to you! You’re welcome Mari! Blessings to you too! Apart from hearing about it in passing, I am new to the practice of Bible Journaling. Thank you so much for this simple introduction! As someone who struggles with anxiety, I think Bible Journaling may help me engage more deeply with the Word by giving my hands something to do and keeping my mind from wandering. You’re welcome Melissa! I’m glad it’s helpful! I’ve been recently drawn to the idea of illustrating thoughts and adding color or design to my journal pages, since it accesses and engages a different part of the brain that just journaling. But have such a hard time with lettering. My handwriting isn’t very pretty nor artistic looking, so it ends up being very frustrating. maybe just color or squiggles like you have here will be a good place to start. Yes Karen! Start with lines and doodles – I think it’s the perfect place to start. I love your doodles and suggestions for journaling. I spy some short hand scribbles too. Thank you for sharing with us here at Tell me a Story.